Lateral moraine on a glacier joining the Gorner Glacier, Zermatt, Swiss Alps. The moraine is the high bank of debris in the top left hand quarter of the image. Glaciology (from Latin: glacies, "frost, ice", and Ancient Greek: λόγος, logos, "subject matter"; literally "study of ice") is the scientific study of glaciers, or more generally ice and natural phenomena that involve ice. Glaciology is an interdisciplinary Earth science that integrates geophysics, geology, physical geography, geomorphology, climatology, meteorology, hydrology, biology, and ecology. The impact of glaciers on people includes the fields of human geography and anthropology. The discoveries of water ice on the Moon, Mars, Europa and Pluto add an extraterrestrial component to the field, which is referred to as "astroglaciology". A glacier is an extended mass of ice formed from snow falling and accumulating over a long period of time; glaciers move very slowly, either descending from high mountains, as in valley glaciers, or moving outward from centers of accumulation, as in continental glaciers. Areas of study within glaciology include glacial history and the reconstruction of past glaciation. A glaciologist is a person who studies glaciers. A glacial geologist studies glacial deposits and glacial erosive features on the landscape. Glaciology and glacial geology are key areas of polar research. A Bylot Island glacier, Sirmilik National Park, Nunavut. This mountain glacier is one of many coming down from the interior ice cap on top of the Byam Martin Mountains. Glaciers can be identified by their geometry and the relationship to the surrounding topography. There are two general categories of glaciation which glaciologists distinguish: alpine glaciation, accumulations or "rivers of ice" confined to valleys; and continental glaciation, unrestricted accumulations which once covered much of the northern continents. Alpine – ice flows down the valleys of mountainous areas and forms a tongue of ice moving towards the plains below. Alpine glaciers tend to make the topography more rugged, by adding and improving the scale of existing features such as large ravines called cirques and ridges where the rims of two cirques meet called arêtes. Continental – an ice sheet found today, only in high latitudes (Greenland/Antarctica), thousands of square kilometers in area and thousands of meters thick. These tend to smooth out the landscapes. Accumulation, where the formation of ice is faster than its removal. Wastage or ablation, where the sum of melting, calving and evaporation (sublimation) is greater than the amount of snow added each year. Snow line, the area that marks the transition from the accumulation to the ablation zone and vice versa. Khurdopin glacier and Shimshal River, Gilgit-Baltistan, northern Pakistan 2017. Several glaciers flow into the Shimshal Valley, and are prone to blocking the river. 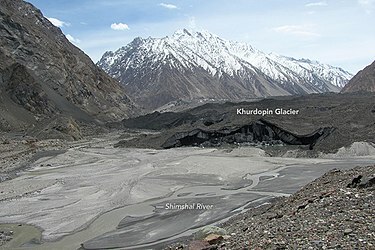 Khurdopin glacier surged in 2016–17, creating a sizable lake. 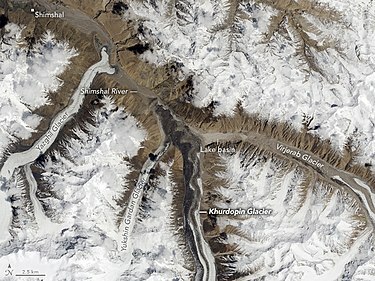 Glaciers of Shimsal Valley from space, May 13, 2017. Khurdopin glacier has dammed the Shimshal River, forming a glacial lake. The river has started to carve a path through the toe of the glacier. By early August 2017, the lake had completely drained. When a glacier is experiencing an input of precipitation that exceeds the output, the glacier is advancing. Conversely, if the output from evaporation, sublimation, melting, and calving exceed the glaciers precipitation input the glacier is receding. This is referred to as an interglacial period. During periods where ice is advancing at an extreme rate, that is typically 100 times faster than what is considered normal, it is referred to as a surging glacier. During times in which the input of precipitation to the glacier is equivalent to the ice lost from calving, evaporation, and melting of the glacier, there is a steady-state condition. Within the glacier, the ice has a downward movement in the accumulation zone and an upwards movement in the ablation zone. 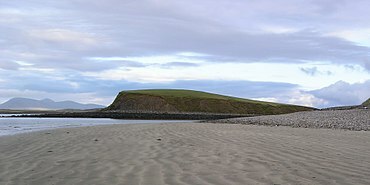 an acute ridge of rock where two cirques meet. alternating thin sedimentary beds (coarse and fine) of a proglacial lake. Summer conditions deposit more and coarser material and those of the winter, less and finer. (Terminal) material deposited at the end; (Ground) material deposited as glacier melts; (lateral) material deposited along the sides. smooth elongated hills composed of till. large subglacial elongated hills transverse to former ice flow. ^ Richard S. Williams, Jr. (1987). "Annals of Glaciology, v.9" (PDF). International Glaciological Society. p. 255. Retrieved 7 February 2011. ^ a b Mahapatra, G.B. (1994). Text book of Physical Geology. Nazia printers, Delhi. p. 269. ISBN 81-239-0110-0. Wikimedia Commons has media related to Glaciology. Institute of Meteorology and Geophysics, Univ. of Innsbruck, Austria.